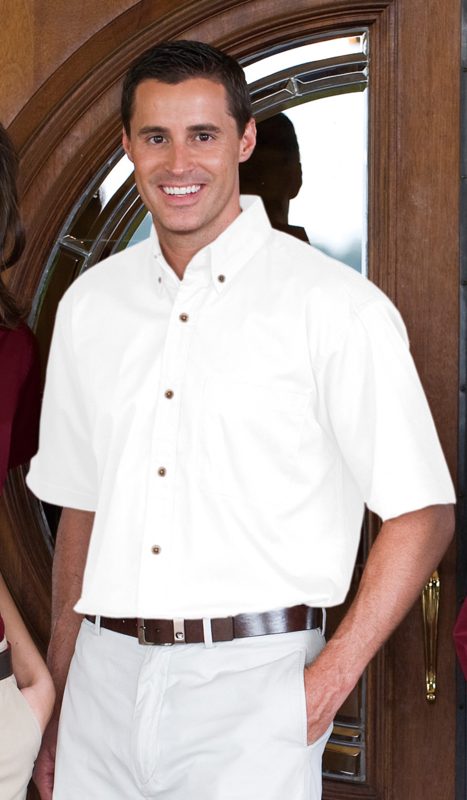 - Jonathan Corey Men's 5.0 Ounce Short Sleeve Brushed Twill 60% Cotton/40% Polyester Shirt. - Button down collar, left chest pocket, hemmed short sleeve, single needle top-stitching throughout, shirttail hem and woodtone buttons. Jonathan Corey Men's 5.0 Ounce Short Sleeve Brushed Twill 60% Cotton/40% Polyester Shirt. Button down collar, left chest pocket, hemmed short sleeve, single needle top-stitching throughout, shirttail hem and woodtone buttons. Center back pleat. Sizes: XS-6XL. Colors: White, Black, Burgundy, French Blue, Hunter, Khaki, Navy, Red, Royal. Style Ships From Pageland, SC.